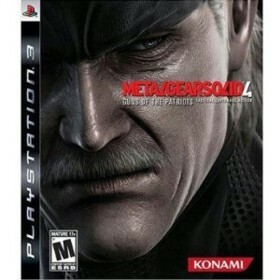 Metal Gear Solid 4: Guns of the Patriots is a Playstation 3 game in the Action genre. The game was published by Konami and developed by Kojima Productions. The game has an ESRB Rating of M (Mature 17+) and was released on 2008-06-12. The game's official site can be found at www.konami.jp/mgs4/global. I will preface this review by stating that I have played and completed all of the previous games in the Metal Gear series (with the exception of the ones released for the Playstation Portable - Metal Gear Acid 1 and 2 and Portable Ops). I felt the need to state this upfront because enjoyment of Metal Gear Solid 4 relies heavily on how much you understand the Metal Gear Universe - its characters, its environment, and most importantly, its story. Metal Gear Solid 4 attempts to tie up all the loose ends and plot elements that were created in the previous games and I felt it did a very good job. Those new to the series, however, will have a very difficult time grasping and understanding much of the story. That's not to say they wouldn't enjoy the game - it does have amazing production values and is one of the best games for the Playstation 3, and the gameplay is very fun as well. However, since the game is about 40% gameplay and 60% cutscenes, they won't find the overall package as entertaining as fans of the series. The game took me about 15 hours to complete on the normal difficulty setting and I plan to play through it again in a few months on a higher difficulty level. The only part of the game that I didn't like too much was the weapon customization feature. This could have been an amazing feature, but the customizations are so limited for each weapon that it seems almost pointless. For example, the most customizable gun in the game can only have 5 mods chosen from a selection of around 15 parts. For most weapons I wound up just purchasing a laser sight and a suppressor and that was it. Overall, if you are a Metal Gear fan I give this game my full recommendation. For others, I would recommend playing the earlier games in the series first before playing through this one.